Medicine will never be the same. 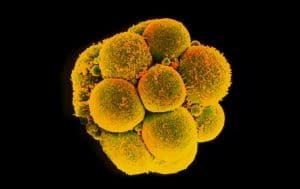 The UK has given researchers at the Francis Crick Institute permission to edit the genes of early-stage human embryos. This is huge news, not only in genetics and biology fields, but for science as a whole. No other researcher has ever been granted permission to perform gene editing on viable human embryos before. The usual fears of designer babies and slippery slopes popped up, but as most of the general news sources reported, those fears are relatively unwarranted for this research. In fact, this project, with is led by Dr. Kathy Niakan, could arguably be closer to the existential hope side of the spectrum. Niakan’s objective is to try to understand the first seven days of embryo development, and she’ll do so by using CRISPR to systematically sweep through genes in embryos that were donated from in vitro fertilization (IVF) procedures. While research in mice and other animals has given researchers an idea of the roles different genes play at those early stages of development, there many genes that are uniquely human and can’t be studied in other animals. Many causes of infertility and miscarriages are thought to occur in some of those genes during those very early stages of development, but we can only determine that through this kind of research. It may be hard to see how preventing miscarriages could be bad, but this is a controversial research technique under normal circumstances, and Niakan’s request for approval came on the heels of human embryo research that did upset the world. Last year, outrage swept through the scientific community after scientists in China chose to skip proper approval processes to perform gene-editing research on nonviable human embryos. Many prominent scientists in the field, including FLI’s Scientific Advisory Board Member George Church, responded by calling for a temporary moratorium on using the CRISPR/Cas-9 gene-editing tool in human embryos that would be carried to term. Max Schubert, a doctoral candidate of Dr. George Church’s lab at Harvard, explained that one of the reasons for the temporary moratorium was to give researchers time to study the effects of CRISPR first to understand how effective and safe it truly is. “I think [Niakan’s research] represents the kind of work that you need to do to understand the risks that those scientists are concerned about,” said Schubert. John Min, also a PhD candidate in Dr. Church’s lab, pointed out that the knowledge we could gain from this research will very likely lead to medications and drugs that can be used to help prevent miscarriages, and that the final treatment could very possibly not involve any type of gene editing at all. This would eliminate, or at least limit, concerns about genetically modified humans.